Molly Mehling is an ecologist, sustainability scientist, photographer and educator who focuses on conducting and communicating science in ways that lead to useful knowledge, induce learning, create community, and lead to more resilient social, economic and ecological systems. Her work centers on the condition of aquatic resources with particular concern for issues that have implications for children’s environmental health. Molly examines spatial patterns of bottom-dwelling aquatic invertebrates at the water’s edge to understand the influence of human activities. Other research has addressed the role of stream productivity on methyl mercury bioaccumulation, the effects of atrazine on stream biota, and the assessment of risk perception of environmental contaminants. By understanding how ecosystems work and how pollutants move through them, we can more effectively reduce human exposure to harmful contaminants. As a photojournalist and science communicator, Molly is involved with activities using or promoting the use of photography for nature appreciation, formal and informal science education, community development, and environmental problem solving. She coordinates public service oriented photography workshops for scientists at Ecological Society of America and, with support from the Legacy Institute of Nature and Culture, is developing conservation photography workshop curriculum. She is a NANPA College Photography Scholarship Program committee member, a photographer for the Meet Your Neighbours initiative, a 2011 Research Ambassador Fellow, and is serving as a photographer for the local independent newspaper, the Silver Spring Voice. Her work is heading in a direction that merges informal science education, photojournalism, public engagement and the science of aquatic ecotoxicology. She hopes to work more directly with communities to assess value and risk perception and to facilitate and evaluate information exchange on issues of water resources and environmental health. RAP staff walked through Molly’s draft PowerPoint presentations, offering pointers and clarifications, and adjustments to make the presentations appropriate for specific audiences that Molly spoke to or wrote for, based on established contacts and experiences. RAP staff also helped Molly distill a statement of her primary research interests. While science curricula and standards are prevalent for K-12 education, there is little attention given to introducing young 3 – 5 year olds to science or scientific concepts. 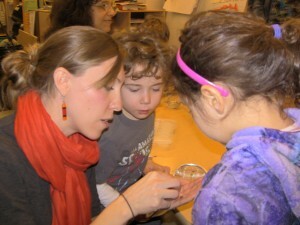 Molly prepared a short (15-20 minute) PowerPoint of images of benthic invertebrates to show to twelve 4-5 year olds at The Evergreen State College Campus Children’s Center. Once the children were introduced to the animals, they were allowed to look at and touch invertebrates that Molly had gathered from a nearby pond. Molly successfully introduced children to some of the biota they see in their backyards, as well as the important ecological roles they fill. Key to the Research Ambassador Program’s model is reaching non-traditional public audiences, i.e., people that may not attend a local museum or participate in a special lecture. As we ask how to reach those audiences, we recognize the need to go to those audiences wherever they may be. While Molly was visiting, we arranged a meeting with staff at theno need to link this again The Evergreen State College Campus Children’s Center to draw upon their expertise. They opened up a world of communities of childcare providers, as well as parenting magazines and social groups. Often local communities have informal or formal networks of mothers, single mothers, or single fathers. Often their activities center around weekly “outings.” Scientists could host ‘outings’ at local beaches, lakes, parks, or museums, reaching a new audience that might not otherwise seek out a scientist to talk to. Parents often read (or receive advertisements for) parenting magazines. Scientists could publish short articles relating the interests of parents to their research – i.e., the real or perceived dangers of environmental toxins or food additives. Childcare providers often participate in local, regional, or national networks and conferences. Scientists could attend these meetings, conferences, or events and introduce ideas for bringing scientific exploration into preschool classrooms. Childcare providers have specialized magazines and journals that they often read. Scientists could author articles for these publications. Finally, many colleges, and most communities, have child care providers and day care centers. Scientists such as Molly can return to their home communities and offer short presentations to the children at the center. Molly also presented her work to a group of faculty, students and staff at The Evergreen State College. Molly was our first fellow to present at the Campus Children’s Center. We realized that presenting to such a young audience forces scientists to really consider the core essence of their research. Meeting with staff at the Children’s Center also reaffirmed our understanding that each community is different, and contains hidden worlds of norms, communication networks, newsletters, and events. Entering these worlds is greatly simplified by relying on an ‘ambassador’ familiar with the community that can assist in making connections and understanding dynamics.